any horny growth, such as a wart or callosity. actinic keratosis a sharply outlined wartlike or keratotic growth, which may develop into a cutaneous horn, and may become malignant; it usually occurs in the middle aged or elderly and is due to excessive exposure to the sun. Called also senile or solar keratosis. (See Atlas 3, Part F). keratosis follicula´ris a slowly progressive autosomal dominant disorder of keratinization characterized by pinkish to tan or skin-colored papules on the seborrheic areas of the body that coalesce to form plaques, which may become crusted and secondarily infected; over time, the lesions may become darker and may fuse to form papillomatous and warty malodorous growths. Called also Darier's disease and Darier-White disease. keratosis palma´ris et planta´ris palmoplantar keratoderma. keratosis pharyn´gea horny projections from the tonsils and pharyngeal walls. Called also pharyngokeratosis. keratosis pila´ris hyperkeratosis limited to the hair follicles. keratosis puncta´ta a hereditary hyperkeratosis in which the lesions are localized in multiple points on the palms and soles. seborrheic keratosis (keratosis seborrhe´ica) a benign, noninvasive tumor of epidermal origin, marked by numerous yellow or brown, sharply marginated, oval, raised lesions. senile keratosis (solar keratosis) actinic keratosis. Any lesion on the epidermis marked by the presence of circumscribed overgrowths of the horny layer. actinic keratosis a sharply outlined verrucous or keratotic growth, which may develop into a cutaneous horn, and may become malignant; it usually occurs in the middle-aged or elderly and is due to excessive exposure to the sun. keratosis follicula´ris a hereditary form marked by areas of crusting, itching, verrucous papular growths which may fuse to form papillomatous and warty malodorous growths. inverted follicular keratosis a benign usually solitary epithelial tumor originating in a hair follicle and occurring as a flesh-colored nodule or papule. keratosis pharyn´gea that characterized by horny projections from the tonsils and the orifices of the lymph follicles in the pharyngeal walls. seborrheic keratosis , keratosis seborrhe´ica a benign tumor of epidermal origin, marked by soft friable plaques with slight to intense pigmentation, most often on the face, trunk, and limbs. senile keratosis , solar keratosis actinic k.
any skin lesion in which there is overgrowth and thickening of the cornified epithelium. Approximately 20% of these skin lesions develop into squamous cell carcinoma. Prevention includes the use of sunscreen and the avoidance of drugs known to cause photosensitivity reactions. Kinds of keratosis include actinic keratosis, keratosis pilaris, keratosis senilis, and seborrheic keratosis. keratotic, adj. Dermatology A condition characterized by ↑ keratin production See Actinic keratosis, Seborrheic keratosis, Stucco keratosis. 1. Growth of the horny layer of the skin; a callus, callosity, or keratoma. Liquid nitrogen destroys these lesions and prevents them from progressing to other cancers of the skin. Keratinization of the mucosa of the mouth to an unusual extent, or in locations normally not keratinized, as a result of an inherited autosomal dominant gene or the more common effect of tobacco and other carcinogens. A congenital abnormality of the palms and soles, characterized by a dense thickening of the keratin layer in these regions. The disorder is characterized by an accumulation of horny material at follicular orifices of persons with rough, dry skin. It is most pronounced in winter on lateral aspects of thighs and upper arms with possible extension to legs, forearms, and scalp. There is no specific therapy, but keratolytic lotions may be of some value. Discrete horny projections from the sweat pores of the palms and soles. A benign skin tumor that may be pigmented. It is composed of immature epithelial cells and is quite common in older adults. Its etiology is unknown. Keratoid, nevoid, acanthoid, or verrucose types occur in older adults and in those with long-standing dry seborrhea, on the face, scalp, interscapular or sternal regions, and backs of the hands. The yellow, gray, or brown sharply circumscribed lesions are covered with a firmly adherent scale, greasy or velvety on the trunk or scalp but harsh, rough, and dry on the face or hands. Thorough curettage is effective. This leaves a flat surface that becomes covered with normal skin within about 1 week. Pedunculated lesions can be removed surgically. Cautery may produce scarring and should not be used. An inaccurate synonym for actinic keratosis, which is caused by accumulated ultraviolet light exposure, not by aging. A white, corrugated lesion found on the oral mucosa usually in the muccobuccal fold where chewing tobacco has been habitually placed. Small white patches in the skin arising from excessive local reproduction of the horny outer cells, so that more than the normal amount of KERATIN is formed. Solar keratosis, caused in the elderly by over-exposure to the sun, is a precancerous condition. Keratosis may also affect the hair follicles causing baldness, the outer and middle ears causing obstruction of the ear canal and CHOLESTEATOMA, and the mucous membranes of the lip and of the throat. A skin disease characterized by an overgrowth of skin, which usually appears discolored. n skin condition indicated by the presence of noticeable increased growth and thickening of cornified epithelium. 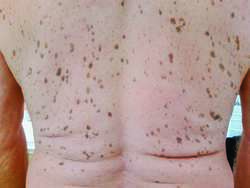 Actinic keratosis, seborrheic keratosis, and keratosis senilis are examples of this skin condition. Any epidermal lesion marked by circumscribed overgrowths of horny layer. n 1. a horny or cornified growth (e.g., wart, callosity). n 2. a condition characterized by cornification, or hyperkeratinization, of the tissues. n an overgrowth of the horny layer of the epidermis caused by excessive exposure to the sun. n a skin condition found in Reiter's syndrome characterized by pustules and crusting; once incorrectly associated with gonorrhea; more recently considered a genetic disorder occurring mostly in men between the ages of 20 and 25.
n keratosis of the lips in elderly individuals. These lesions should be considered precancerous. n localized areas of increased cornification (hyperkeratinization). Such lesions are seen particularly on the lips. n benign, pigmented, superficial epithelial tumors that clinically appear to be pasted on the skin of the trunk, arms, or face. Characterized histologically by marked hyperkeratosis, with keratin cyst formation, acanthosis of basal cells, and melanin pigmentation, all above the level of the adjacent epidermis. n small, firm lesions occurring principally on the face and back of the hands in elderly people or those exposed to the sun. 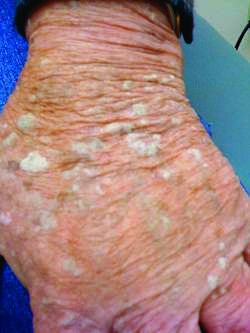 There is hyperkeratosis with irregular and atypical proliferation of the cells of the rete Malpighi. The condition is one of premalignancy with tendency toward epidermoid carcinoma. See also leukoplakia. any horny growth on the skin, such as a wart or callosity; a firm, elevated, circumscribed area of excessive keratin production. Common in humans but uncommon in animals. varies from a sharply outlined verrucous or keratotic growth to poorly defined areas of erythema, which are premalignant lesions. Due to excessive exposure to the sun. Called also solar keratosis. 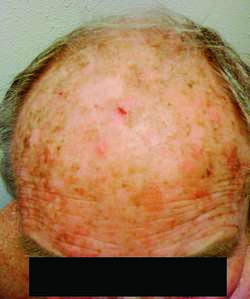 hyperkeratosis limited to the hair follicles. single or multiple elevated plaques and nodules often hyperpigmented with a hyperkeratotic greasy surface. They are benign, of unknown etiology, but have no connection with seborrhea. Occur in dogs and humans.